Intelligently automating various online tasks can result in increased productivity. One such case is that of automatically sending the received attachments in Gmail to cloud storage. 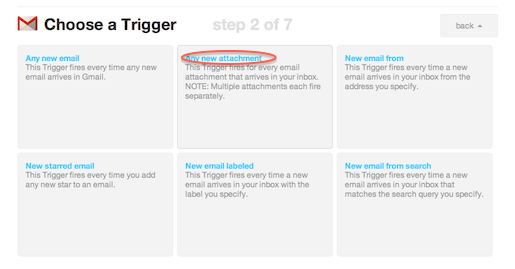 A number of solutions exist for automating this task; below is a step-by-step guide of using the popular service IFTTT to automatically send Gmail attachments to Dropbox, Box, Google Drive or SkyDrive. Create a free account on IFTTT.com or login to an existing one. Choose Action Channel: Select Dropbox (or Box, SkyDrive, Google Drive) - Authorization by the cloud storage services will be needed for IFTTT access. Done! By default, files will be stored in the folder IFTTT/Gmail. The location of folder, file name etc. can be customized in step 9. The attachment file limit is set as 30MB.